An all-new JenClothing EXCLUSIVE! This LDS temple dress is so comfortable and flattering. The simple style features a round neckline, gathered elastic waistline, long sleeves and pockets. The fabric is a super soft knit, with a nice stretch to it. Fully lined. XS/S = 55" M = 56" Large = 57" XL/XXL= 58"
Extremely soft fabric with nice stretch to ensure the perfect fit! Comfortable, flattering & this perfect dress even has pockets!! **How do I find my size? 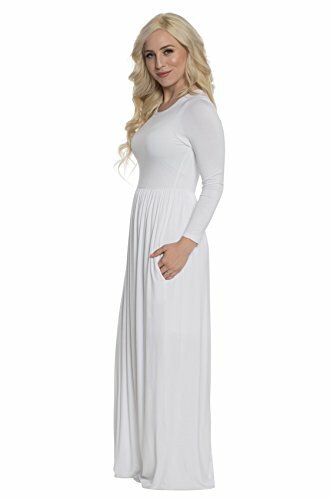 Use the Amazon Women's Apparel Size Chart for this dress!